Not to long ago we wrote a post that discussed the importance of creating engaging content for your directory website. This is a point that we can’t belabour enough. If you want to create a successful directory website, you’ll have to create content that provides value to your visitors. The directory is important but it’s the content that draws people in and keeps them coming back. Content is also what will help you rank for crucial keywords that attract traffic. In this post, we’re going to cover the basics of performing keyword research for your directory website. More specifically, how can you come up with a list of potential target keywords, categories and post topics. Keep in mind that effective keyword research is an ongoing process that you’ll have to repeat every time you sit down to refresh your content calendar. It’s also important to remember that using tools to uncover keywords, does not eliminate the research process. Sure, some keywords will be easy to find, but others will require a little more digging. Let’s jump right into the details, shall we? It’s possible to make your keyword research process quite complicated and generally that’s not a good idea. The more complicated and tedious your process is, the more likely you are to abandon it completely. In creating a directory website, whether it’s for businesses, events, tourism or anything else, you should start with a broad list of topics that are of interest to your audience. From there you can narrow them down until you get to the point where you’re creating content that targets a specific keyword phrase. As a directory website, you’ve got it pretty easy when it comes to keyword research. Coming up with keywords and topics just takes time — most of the information you’re looking for can be easily found. The best place to start is at the top of the funnel and that usually means starting with the name of your destination. What are the general topics that your target audience might be searching for in relation to your directory website. Already we’ve got some broad topic ideas that we can start working with. Many of these sound like great categories and potentially navigation items as well. As you’re doing this research, it’s a good idea to input your information into a spreadsheet. As it starts to become more detailed, you’ll want to create post topics that are well categorized. Next, we head back to out Google Search and start typing in one of our categories from above. As you come across new ideas, add them ideas to your spreadsheet and look for new topics that merit further exploration. For example, let’s perform a search for “Koh Chang things to do”, and take a look at the SERPs, we’ll find a whole list of potential topics. Dig into each of the top 10 URLs and make note of any potential topics. Next, if you scroll down to the bottom of the page, you’ll find a list of related searches. You can add each of these to the “Koh Chang things to do tab”. Some of the items in this list of related searches might make good post topics while others might require a little further exploration. Related searched are also great secondary keywords that can be used within your posts. You can also start digging into some of the top 10 posts in the SERPs. Using this opportunity to examine the on-page SEO for the top results. 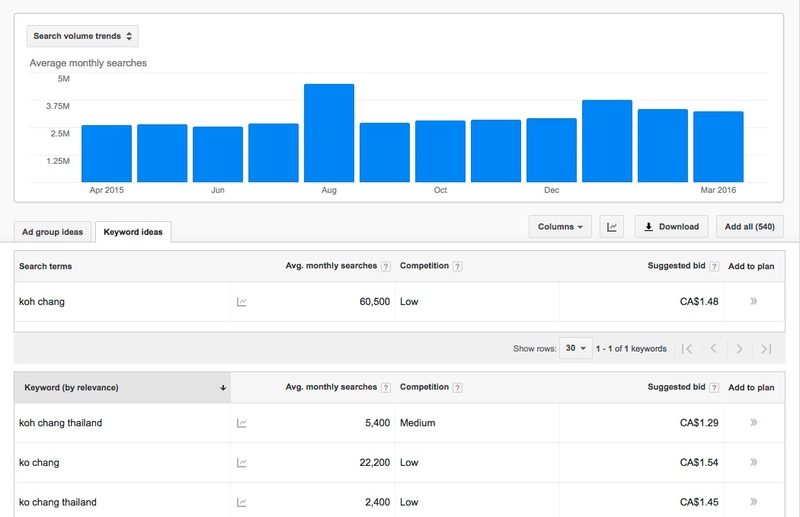 Using the Google Keyword Planner is another way to uncover potential ideas. We can quickly discover an initial list of categories and then dive deeper into some of the target keywords. Once you’ve loaded the Google Keyword Planner, you’ll notice 2 tabs at the top, just underneath your search volume trends. One is called “Ad group ideas” and the other is called “Keyword ideas”. We’re going to stick with the Ad group ideas tab as we search for ideas. You could even take this one step further and create individual posts for specific waterfalls, scuba diving locations and cooking schools. But before you do, plug the information into the Keyword Planner and take a look at the search volume like you see in the image below. This post is by no means a complete guide to performing keyword research. But it should be enough to get your creative juices flowing. With a little bit of effort, it doesn’t take long to come up with a list of great keywords, categories and topics for posts that have the potential to drive traffic to your website. Creating a successful directory website takes time and effort. The most important ingredient is the content that you’re creating for your visitors. If you’re struggling to come up with content ideas for your directory website, let us know in the comments below. How does potential business decides to get listed on your directory site?